If your wardrobe is dominated by beige-and-black clothes for work, sequin-adorned nighttime clothes, and 101 sports bras, we have a fall shopping assignment for you: bridge the gap. Make your work wardrobe a little trendier and more energetic and watch the sparks fly. When your 9-to-5 self and your 5-to-9 self share more in common, your mornings will get easier (and way more fun), your suitcases will get lighter, and you’ll be able to go straight from a day of meetings to a dinner date with just a few simple adjustments. Here are three office-to-cocktails outfits we’re loving right now, and how to nail the transition from meeting to meetup with minimal effort. GET THE LOOK: (Day) Rolled Sleeve Original Boyfriend Blazer, Square Neck Cap Sleeve Bodysuit, Plaid Side Zip Moto Mini Skirt , Pointed Toe Mules, Color Block O-Ring Tote. (Night) Kitten Heel Sock Booties, Studded Event Bag. 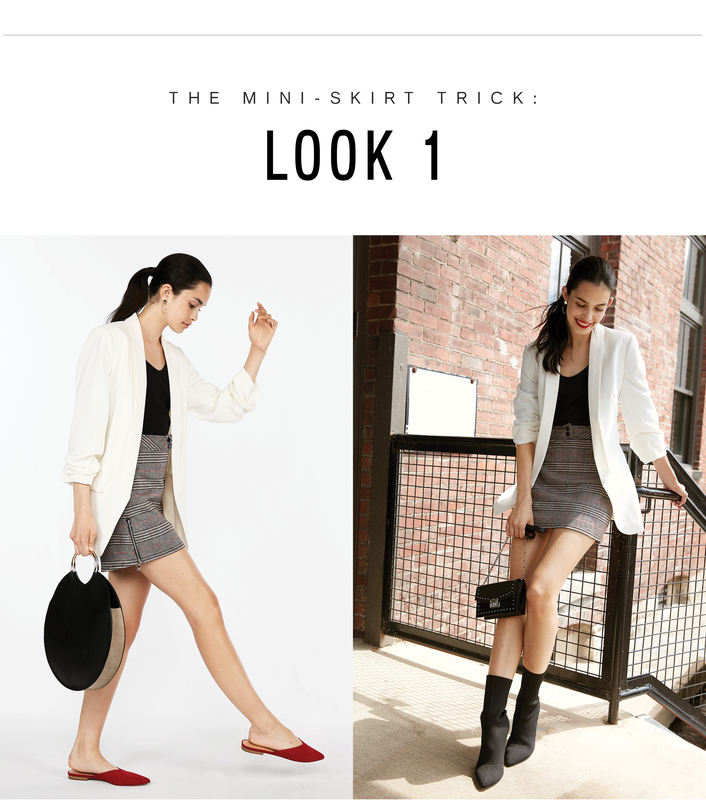 If you want proof that accessories can completely transform your style, look no further than this mini skirt and boyfriend blazer outfit, which skews “sweet” with flats for the office, and “Instagram famous” with pointy ankle boots for your date. A few other simple but significant swaps really help drive the point home. A round bag and classic hoop earrings give the work look a minimalist polish, while a chain-strap bag, stud earrings, and red lipstick give the nighttime spin even more power and sexiness. The best part? Your nighttime accessories can tuck into your daytime bag so you’re not trudging to work with extra cargo. Just leave the daytime pieces at your desk when you leave the office—you can bring them home the following night. You know, when your after-work plans are leftovers and downloading your BFF on your date. GET THE LOOK: Rolled Sleeve Original Boyfriend Blazer, Square Neck Cap Sleeve Bodysuit, Plaid Side Zip Moto Mini Skirt . 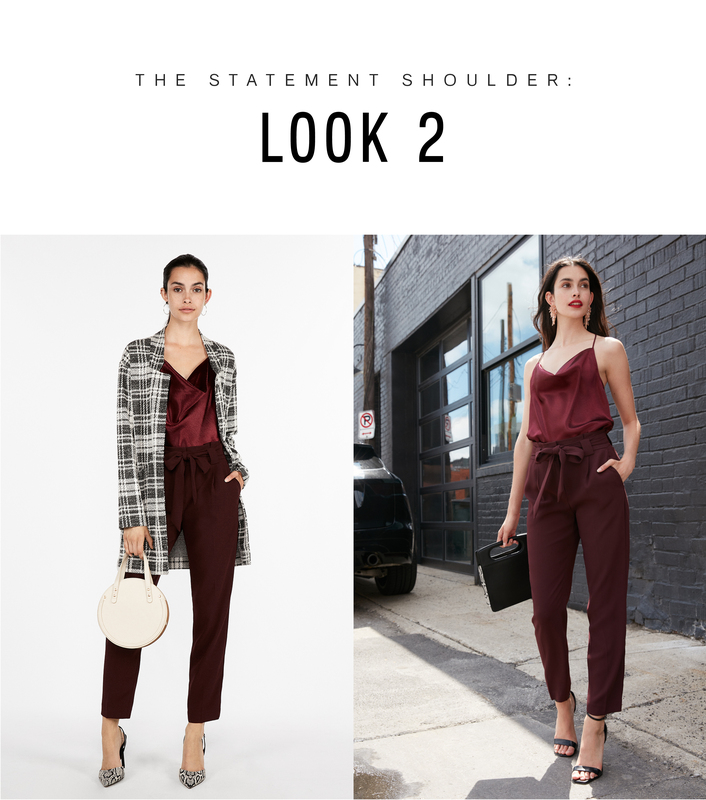 GET THE LOOK: (Day) Plaid Tailored Knit Blazer, Satin Cowl-Neck T Back Cami, High Waisted Sash Waist Ankle Pant, Circle Crossbody Bag, Slingback Pumps. (Night) Cut Out Handle Shoulder Bag, Square Toe Heeled Sandal. Speaking of leaving things behind at work, the second-best way to go straight from the office to a date is to simply undress. You know, not all the way, but a little bit. Here’s what you do: Start with a tonal base—we’re loving a satin cami and high-waist trouser—then make it ladylike for work with a great blazer or jacket and pumps. (A daytime pattern like plaid will make sure the outfit feels conference-room friendly.) When the clock strikes 6 (okay, grrr, 7), just leave the jacket on the back of your desk chair, take down your hair, and walk out the door. If you can manage it, swap your shoes out for an even sexier sandal. But honestly, let’s be real, your bare shoulders are the real heroes here. 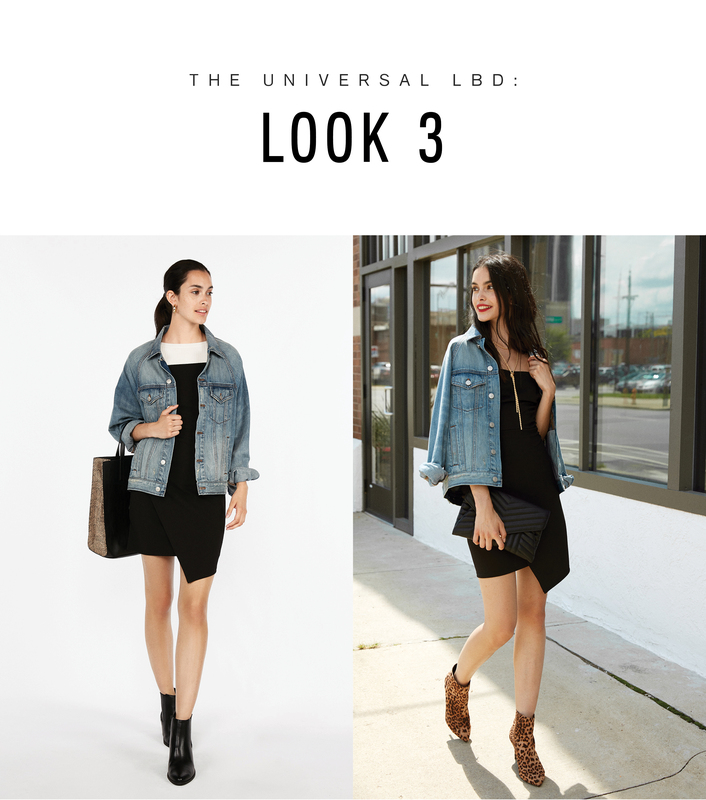 GET THE LOOK: (Day) Distressed Collar Oversized Denim Jacket, Asymmetrical Skirt Cami Sheath Dress, Ribbed Elbow Sleeve Sweater, Heeled Ankle Booties. (Night) Leopard Print Thin Heeled Booties, Front Lock Quilted Clutch.